These are complete papers of experimental research in any branch of physiological sciences. The articles accepted for publication will be made upon the consideration that they describe significant and new findings and that adequate experimental details are given. These are short reports of experimental research, which have considered that the results should be distributed quickly. The experimental data have currently displayed in any scientific meeting are also encouraged for publication. The maximum length allowance will be 1500 words. A maximum of 2 figures and 1 table are allowed with up to 10 references. A letter should be no longer than 1000 words without figure or table and should discuss or comment on an article previously published in the JPBS. Up to 10 references are allowed. Thai-Journal Citation Index (TCI) Centre database since 2012.
for listing in the ASEAN Citation Index (ACI). 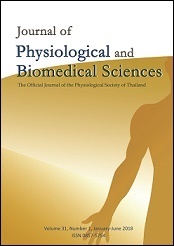 © 2008-2018 Physiological Society of Thailand. All rights reserved.